Meet the beauty world’s most advanced smart mask: FOREO’s UFO Smart Mask Treatment (a.k.a. Ur Future Obsession), a masking device that combines six leading skin care technologies with mini Korean-created sheet masks. You simply secure one of FOREO’s mini sheet masks into the device then let it work its magic. The ingenious device will run a series of effects: there’s everything from sonic pulsations to blemish-battling blue light. Plus, it comes in super-chic pink, mint and fuchsia shades and looks adorable. 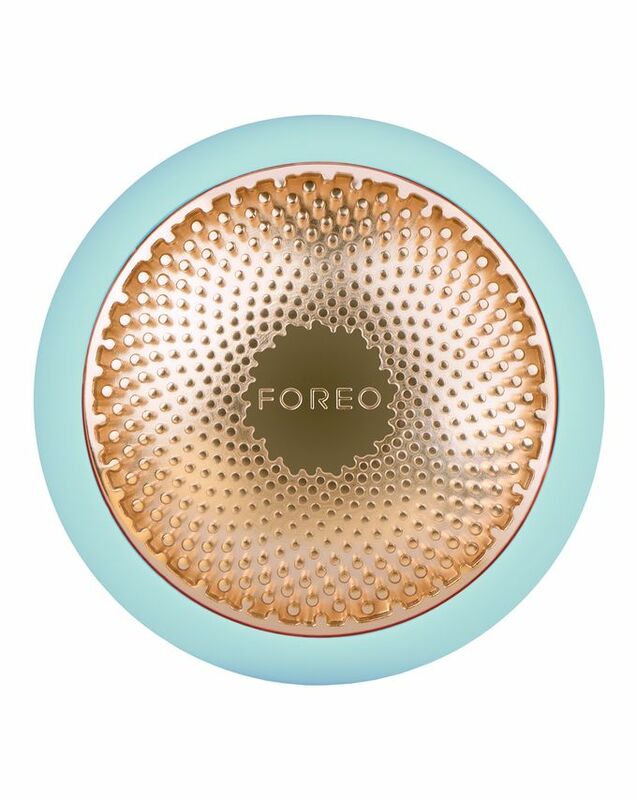 Supercharge your sheet masking and turn a 20-minute treatment into a 90-second treat with FOREO’s UFO Smart Mask Treatment (which, incidentally, stands for Ur Future Obsession), an innovative masking device that will bring an amazing range of technology to your beauty regime. 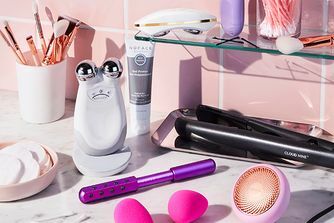 Effortlessly easy and super speedy to use, this super-cute little gadget is designed to be used with FOREO’s mini sheet masks, developed exclusively in Korea and combining plant and fruit extracts and botanical oils. You simply place the sheet mask into your UFO, securing it with the plastic holder attached, then the mask will run a pre-set program. The mask is activated and enhanced by customised UFO treatments, incorporating T-sonic pulsations (a.k.a. vibrations) to improve the absorption of active ingredients; age-defying, collagen-stimulating red light; bacteria-busting and blood circulation-boosting blue light; brightening green light; thermotherapy to help ingredients to penetrate deeper in skin and, finally, cryotherapy (cooling) to tighten pores, simultaneously lifting and firming the skin. 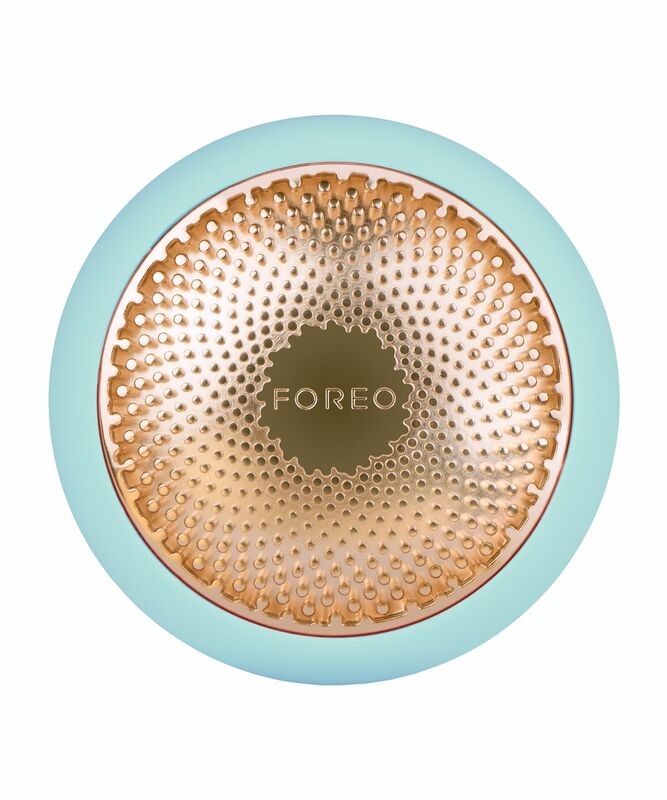 Foreo’s miraculous masks include ‘Make My Day’, which is enriched with hydrating, plumping hyaluronic acid and age-defying red algae and ‘Call It a Night’, which features ginseng and olive oil. You’ll get one of each mask in the box, plus a USB charger. N.b. an app that can be paired with this device will launch on 9/04/18. Use the quick start guide enclosed to start. Simply lift the plastic holder and place your chosen mask over the smooth copper side of the device, securing it with the plastic. Then use the app to set off the pre-prepared program. I love this device - does exactly what it says & quickly. There are a variety of different types of masks available to buy to suit the needs of your skin at the time. Fast, effective & leaves skin feeling & looking superb. Highly recommend. I don't think I have ever tried anything that gave such obvious results so quickly! It's really incredible! Best money I ever spent. Your face looks so plump and healthy! I try to use it every day. I fell in love with the Luna and when I saw this I just had to get it.. I don’t regret it at all! It’s amazing especially with the app and you can use their masks or just your own products. The cooling function is great for puffy eyes in the morning! Amazing product. I was really interested to buy it when I first saw it on Instagram. Goes on so smoothly and you can feel it working its magic with the help of LED lights and warming and cooling effect. My face felt so refreshed and clean! I highly recommend this product to anyone who wants to pamper themselves on a day to day basis. 90 seconds to rejuvenation! No other mask that I've used had the same effect on my skin. It feels super hydrated, smooth and gets this natural glow. I tried the two basic types of masks. I can only imagine what the more expensive ones do. 10/10 This is my first Foreo product and i'm so chuffed! The selling point for me was the light therapy technology, red/green/blue. This is combining 3x sophisticated technologies which have not left me disappointed. You have to download the app and scan your sheet masks too. Saves so much time than lying down with messy sheet masks. My life has changed! Although I was admittedly cynical about what could be achieved in 90 seconds, I was pleasantly surprised by the results. My skin is softer, more supple and plumped up afterwards and the feel-good feeling continued for the next few days. This is such an innovative piece of high technology and it’s worth the price. I travel a lot and it can lead to breakouts and dry skin which is something I don’t like to deal with. But with this device I don’t have to worry about that again. In just 90 seconds my skin is glowing. It’s a worthy investment but it definitely pays off as it helps to save my time and I still have great skin. I love face masks, especially sheet masks, so I was super excited to try out UFO. It’s easy to use and I can feel that my skin is getting all the benefits from the mask. It has this amazing warming and cooling technology which feels great on my skin. And the best part...it only takes 90 seconds. Now I use masks everyday and my skin is so grateful. I hate when I spend so much money on skin care devices and then I have to change batteries or it suddenly doesn't work. This is why I adore UFO and I'm glad I bought it. Once when you bought it you have the whole package: display and usb cable. This is such an innovative device, you don't need to worry about batteries and it's small so you can carry it wherever you want. I'm in love with UFO! I give it 5 stars. No hesitation. It has excellent options, great design, it is easy to use once you get used to it, it can also be a toy. How do I know that? Well, I have to yell at my children to tell me where they put it. They play with it as if it were a toy. Thank God, they have not damaged it. I need to hide it from them. You will see very quick changes using this facial mask. I could not believe it when I saw it. After a few weeks I could see a lot of improvement. I use various functions depending on how I feel and it works great. There is a variety of masks to use. Smooth skin is the goal that I have almost reached with this product. Skin texture has definitely been affected in a positive way. I was hesitant to purchase the Foreo UFO due to the price as I have bought expensive gadgets before and they end up in the drawer hardly used. However I don't regret buying this, it is so easy to use and when I don't have time to sit around for half an hour I can use the UFO and be done in a couple of minutes and my skin is glowing. I am hoping the app will be available soon. Would definitely recommend if you want to amp up your beauty routine. I have bought this product and I am ecstatic about it. First, time spent on this beauty routine is drastically shortened, I am not watching my clock to go through the steps since the device is leading me through it. Second, quality of masks is superior (I got the day and night masks) my skin feels truly silky smooth and rejuvenated. I am glad that, apart from day-night routine, there are a few masks options for different purposes, hydrating, Vitamin E Gel great for eye contour, and highly purifying - cannot wait to try those. Facial masks are history, Sci-Fi experience. It took me a few days to decide whether to buy it or not. The price was high but I could not resist. Years of problems with my skin, countless hours spent treating it, no efficient solution. Healthy skin is all that matters so the price did not stop me. I thought it was all more of a marketing Sci-Fi trick than anything else but I was wrong. Glowing skin, different skin texture, all after just a few days. I could not ask for more. However, I wish it were a little smaller since I have small hands. Early mornings and late nights have meant that I rarely make the time to do a mid-week sheet mask, so this 90-second tool has major appeal. I've used this three times now - two with the 'Make my Day' treatment and one with the 'Call it a Night' mask, and while it's still early days I'm really impressed, especially with the night mask where I've seen the most difference. The heat function is wonderfully soothing, and the T-sonic pulsations really do firm my skin. My complexion is a lot clearer and some of the fine lines on my forehead have smoothed out, and I've also noticed a visible improvement in my skin texture especially. I do find that there's still quite a lot of moisture left in the masks after the 90 seconds, so as an extra treat I'll often cut them in half and place them under my eyes. I can't wait for the app to launch so I can tailor my treatments more, but so far the manual mode is doing the trick. I was lucky to be one of the first people to get this product and it has really made me happy. I do not really like face treatment but my glowing skin has made me love this gadget. It takes facial treatment to a whole new level. I like the fact that I do not have to put any facial mask directly on my face. The whole experience is very enjoyable. UFO is a stunning device that delivers results sooner than you expect them. I never thought I’d be writing this, but beauty can be a thing of absolute joy. With the UFO, reaching that joy is so effortless, you achieve beautiful skin without even noticing it. The Foreo UFO shows the world how masks should be used... warm first then gradually cooling down. How else are the pores meant to absorb the juice!!? Would have been 5 stars if either (a) machine was cheaper or (b) there was an option to use other serums, creams etc ie not Foreo consumables. Fact is the consumables are not that cheap. Plastering several products onto the face is the definition of a nightmare for me. They take too much time to absorb and the results most often aren't longterm. From this aspect the UFO is perfect. It's 90 seconds per treatment, fun to use and the skin looks airbrushed after. If you love masking and wanna do it on the daily with different treatments go for this! You won't regret it!! If you're the type of person that plans their purchases carefully and likes to use high quality products, this is the product for you. I'm careful with my money and I like to invest in products that will last me a long time. This has been my best investment in the last few years, the quality of the product and the masks is top notch. I love sheet masks more than any other masks, so when I saw UFO I knew I had to have it. It exceeded all my expectations! Such a luxurious mask plus light therapy in such a small device! Great results are achieved in matter of minutes! Simply WOW! Simply amazing! Couple of minutes for procedures that take hours in the salons. What a time saver. Effects are immediate and unbelievable. Never has my skin looked so radiant and felt so soft and nourished. Absolutely love it! Pricey, but so worth it! I cannot believe how brilliant this product is. I invested in a variety of the masks and they are all good. There is plenty of product in each packet so I always repeat the treatment 2 or 3 times to get the maximum benefit and enjoyment! I have also used it with a normal mask making sure it isn't one of those that goes stiff. If it is a nice oil or gel-based mask then it works fine with this device making it more versatile. It is a lot of money but honestly you won't regret buying it. This is a game changer. I was hesitant about the results but they are exceptional. It shortens my beauty routine and I feel it is more efficient. I never thought that Sci-Fi would have anything to do with facial masks and facial treatment. That long, messy, boring process that I hated so much. Not any more. Here’s a product that combines it all and looks great. I still have to learn how to use it properly because it offers various combinations. I did my best to have healthy skin and it just did not work. Years of efforts, nothing. It has all changed now because of this product. Facial treatment like never before. Straight out of Sci-Fi films, available at a high cost, but still worth it. Amazing design, lots of features, I even play with it as if it were a toy. You can choose different masks but you do not put them on your face directly. They are placed in the device. There is no usual mess as with sheet masks at all. A real UFO has landed at my home. Just joking. It really looks like a small UFO. Amazing design, great features. This product makes facial treatment so easy and fast. You can literally do it anywhere because there is no mess with sheet masks. I use various masks depending on the needs and the time of day. A top-notch product. It is expensive but it will pay off in the long run. If the results on my soft skin are any indicators, it can only get better from now on. A facial treatment can be so boring, facial masks are no fun on your face. But no more. My skin texture has slightly changed, I feel more confident and I love the whole experience. After a few days of using it, all I can say is that facial treatment will never be the same. My smooth skin feels so great, skin texture has changed for the better after a few days. I had great expectations and they have been met. However, I would like to see this device produced in more colours, maybe one that is colourful like a rainbow. That would be so cool. I could not wait to get this futuristic face treatment invention. My skin can be really sensitive from time to time and few companies can do the trick. As a huge fan of Sci-Fi I love the link between my glowing skin after the facial treatment with this device and its shape and design. Facial treatment has become a lot of fun for me and I always look forward to it.